Two Colorado counties declared public health emergencies and the state has requested federal money for mosquito spraying as the peak of West Nile season approaches. Colorado leads the nation with 392 human West Nile cases and seven deaths. Officials from the two counties — Larimer and Weld, both in northern Colorado — said Monday's emergency declarations were designed to alert the public to the seriousness of the threat and to encourage local governments to step up mosquito-prevention programs. Each county has had two deaths from the disease. Also Monday, the state asked the federal government for $4.5 million to combat the virus, primarily for mosquito spraying, said Doug Benevento of the Colorado Department of Public Health and Environment. "We think that amount will allow us to get through the next month, which is going to be the peak season for West Nile," Benevento said. 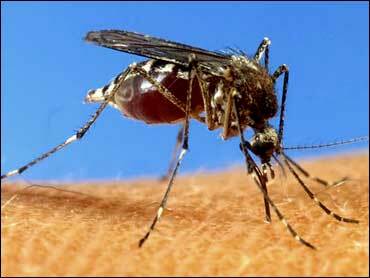 Adult mosquitoes are out in full force and temperatures remain balmy enough for the insects to be active at night. State epidemiologist John Pape predicted the virus will peak in Colorado in two to three weeks. Most often, the virus produces mild flu-like symptoms. In the most serious cases, it can induce a deadly inflammation of the brain. Colorado differs from other states because it reports mild cases of the virus that some do not report. The Centers for Disease Control and Prevention had confirmed only 257 Colorado cases and only six of its deaths as of Monday, according to the organization's Web site. Nationwide, the agency has confirmed 536 West Nile cases and 11 deaths.